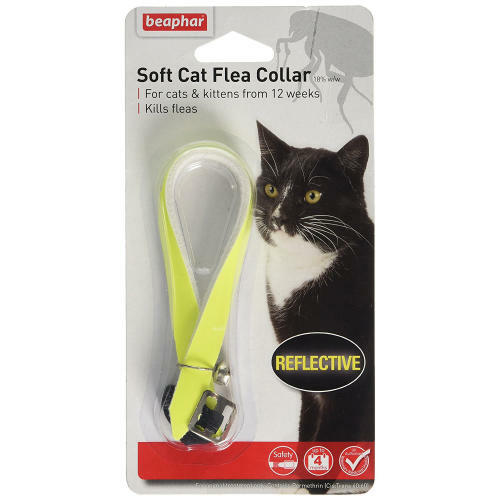 The Beaphar Reflective Flea Collar is perfect for combatting fleas on your cat and prevents their return for up to 4 months at a time. Effective and comfortable, Beaphar Soft Cat Flea Collars provide fashionable flea control, and can be adjusted to fit any cat. The reflective fabric helps your cat to be seen more easily at night, helping to keep your pet safe. Beaphar Soft Cat Flea Collars are suitable for cats and kittens over 12 weeks of age. Contains an insecticide. Complete with silver bell. Do not remove the collar from the blister until ready for use. Fasten around your cat’s neck (coloured side facing outwards), leaving enough room to insert 2 fingers between the collar and neck. Do not fit too tightly, to ensure against irritation, but do not fit too loosely, or the cat may be able to get a foot or tooth under the collar, in an attempt to remove it, and become caught up. Remember to periodically check and loosen the collar if fitted onto a growing cat. Cut off any collar sticking out beyond the buckle. Wrap this cut-off in a bag and throw it in your dustbin. Keep the empty blister card for reference until the collar is thrown away.